COMPASSIONATE CLIMATE ACTION: Does Oversimplifying Help or Hinder Efforts to Understand Climate Change? Does Oversimplifying Help or Hinder Efforts to Understand Climate Change? Over at Reading Rainbow, LeVar Burton said recently that "the 'Arab Spring' can be directly attributed to the sharing of literature and written commentary, read by millions of people, via social media." The Arab Spring has also been attributed to high unemployment rates among male youths in the Middle East and the sky-rocketing food prices caused that year by the heat waves and wildfires in Russia the summer before that killed 30% of that country's grain crops, shutting down exports. A couple of days ago at Grist, I read about a 5 year old girl who "found the remains of a previously undiscovered dinosaur" on the Isle of Wight. On a beach there, she found a fossil of a 115 million year old flying reptile, now named Vertidraco daisymorrisae ("dragon from the Isle of Wight" + the young discoverer's name). Here's the thing. What Daisy Morris found was a small pterosaur, not a dinosaur at all. While lots of media sources got it wrong, both amateur paleontologists and self-confessed "paleo-pedantics" are lamenting this lack of paleo literacy amongst the general public. (I count myself in the dinosaur-illiterate group. Heck, I still have to check with little kids to make sure the long-necked vegetarian one is the brontosaurus.) (Am I right?) Other commenters are pointing out that the pedantry is a buzz kill when we should be celebrating this young girl's find, despite evolutionary illiteracy among the masses. I feel the experts' pain – every time I see a spelling mistake in print or hear a grammatical error over the airwaves. But I've learned to accept that these typos and booboos don't spell the end of the world. So, are we oversimplifying science and world events to our peril? Should people understand all the causes of the Arab Spring (including foreign manipulation and the role of mercenaries) in order to better understand world events? Do people need a firmer grasp of zoology, paleontology and evolutionary biology in order to understand the rate of biodiversity loss and the sixth mass extinction we're experiencing? 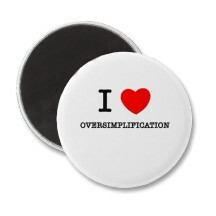 Oversimplification is defined as simplifying to the point of causing misrepresentation, misconception, or error; or causing distortion or error by extreme simplification of a subject (thank you, The Free Dictionary). But is it okay to have a climate illiterate public as long as we win the battle of the bumper stickers? As long as people generally lean or believe in the direction of actions that will safeguard the future? In simpler words, is oversimplification our friend or our foe?